Leona Maguire has won the Mark H McCormack medal as the leading women's player in 2015 world amateur golf. 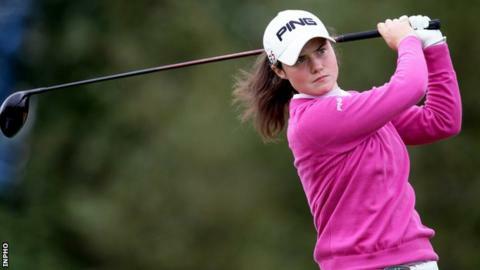 Cavan's Leona Maguire has won the Mark H McCormack medal as the leading 2015 women's player in world amateur golf. The 20-year-old had a superb season winning three tournaments and came within one shot of winning a first pro event at the Ladies European Masters. Maguire, who attends Duke University in North Carolina, receives the medal from both the R & A and the USGA. "To be able to call myself the best female amateur in the world is a nice feeling," said Maguire. Maguire won the Darius Rucker Intercollegiate, the ACC Championship and the NCAA South Bend Regional this year. In May, she received the 2015 ANNIKA Award as the best golfer in American women's college golf. She was the leading qualifier after the stroke play stage of the Ladies British Open Amateur Championship at Portstewart, where she reached the last 16. "It [medal] caps a fantastic year for me and it is rewarding after all the hard work I have put in, and my family as well," Maguire said.